and Industry and Chartered Accountants Australia and New Zealand. Picture: Courtesy of The Examiner. 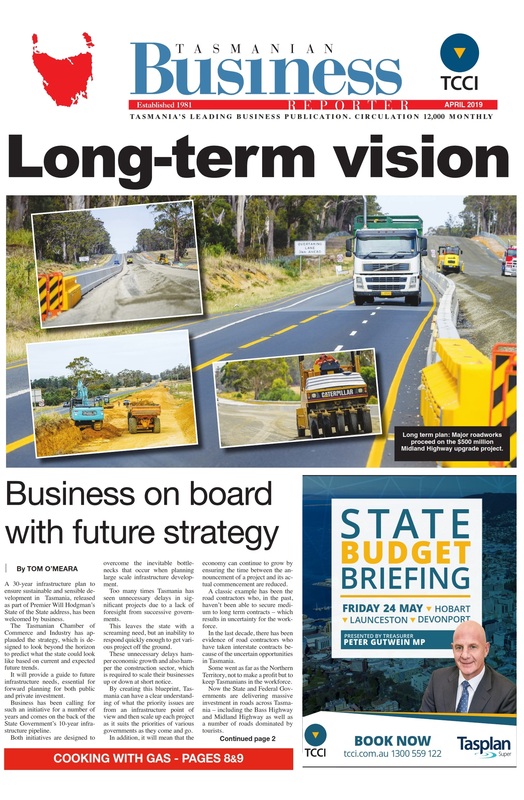 The July edition of the Tasmanian Business Reporter is now available, click on the image to visit the online version. THE doyen of the Australian fruit and vegetable industry and the man billed with transforming the Geelong economy through the revival of the local football team, Frank Costa AO OAM has told a packed audience in Launceston that Tasmanians can have a team in the AFL if they are prepared to work together. Mr Costa was visiting Tasmania as part of a thought leadership program supported by the Tasmanian Chamber of Commerce and Industry as well as Chartered Accountants Australia and New Zealand, designed to spur debate on the issue of economic development throughout Tasmania. After taking over his parents’ fruit and vegetable store as a young man and transforming it into the largest fruit and vegetable producer in Australia, Mr Costa turned his hand to the Geelong Football Club taking both it and the local economy from economic basket case to a sustainable modern growth economy. Mr Costa told the some 150 gathered at Launceston’s Hotel Grand Chancellor, that for such a plan to succeed, all groups must come together and work in the same direction. “Look at where your strengths are,” Mr Costa said. Mr Costa said in Geelong in the early 1990s the economic picture was looking grim, with the loss of the Pyramid Building Society and the decline of the manufacturing sector. “However the business community came together to form the G21 group and worked together to get the community’s priorities right,” Mr Costa said. “Overall it worked pretty well and the idea of amalgamated councils was good thinking. “We are now transitioning from a manufacturing base to a smart-based economy, through a partnership with Deakin University, the Geelong Football Club and the council. “We’ve created a learning centre [at Kardinia Park] which has had 20,000 students through, teaching young kids lifestyle to ensure they have the right diet and the right exercise. “Next we are going to set up a rehabilitation centre. ‘‘We’ve got the Transport Accident Commission to move down from Melbourne as well as the NDIS and Worksafe to create a rehabilitation centre where we will be able to treat our injured football players. Mr Costa said he believed Tasmania’s best chance of a team in the AFL was to approach North Melbourne to relocate. “If you had eight home games in Tasmania – four in Hobart and four in Launceston, got rid of that divide across Tasmania and simply said ‘we are Tasmanians for football,’ you’d have a real chance. “Then ask the AFL to give us an academy for players in Tasmania, where you can develop your own young boys. “Imagine a Peter Hudson or a Darrel Baldock or a young Royce Hart playing for Tasmania. You’d get thousands of mainlanders coming to the state to watch their team play Tassie – but then they’d spend four or five days in Tasmania which would help the tourism and hospitality industry,” Mr Costa said. Those councils are Clarence, Hobart, Sorell, Kingborough, Glenorchy, Glamorgan Spring Bay, Meander Valley, West Tamar, George Town, Northern Midlands and Launceston. Planning and Local Government Minister, Peter Gutwein said four councils have indicated they do not wish to take part in the next stage of the process – Brighton, Flinders Island, Kentish and Latrobe, however his door remains open and if they wish to submit a proposal at a later point he would welcome that.